The #1 source for superhero and popculture-inspired news on the Internet is taking community to a whole new level. Whether you're a fan of Marvel, DC, The Walking Dead, Star Wars or anime, or celebrity news, our fast-growing community is the place to meet others and discuss the things that you love. The great thing about our community is that as you participate by leaving comments, liking the comments of others or by reviewing movies and TV shows, you'll earn points. If you earn enough points, then your user level will rise, unlocking more features and rewards. Over time, your user level can even rise up to Ultimate User Level status. Think of that as like getting an invitation to join the Justice League or the Avengers. 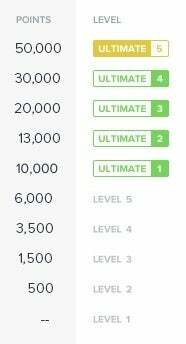 Even within the Ultimate User Level, you can still rise up to different levels, all the way up to Ultimate User Level 5. When you reach that level, well let's just say Batman would be taking his orders from you. What you see now is only the beginning, as we'll continuously be adding new features to ensure that we have the best community around. Eventually, we even plan to reward Ultimate Users with such goodies as exclusive celebrity chats, group movie screenings, and free swag. All you have to be is a ComicBook registered user to get started. Sign up here to start building points to reach Ultimate User status.